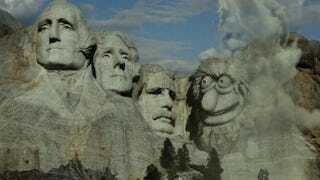 Who defaced Mount Rushmore best? Arguably, the Mount Rushmore National Memorial is already a defacement; for the Lakota, the faces of US presidents represent a theft and desecration of the Black Hills. But there are many who find the faces of George Washington, Thomas Jefferson, Theodore Roosevelt, and Abraham Lincoln to be a sacred site of Americana, which makes them all the more fun to reface, deface, and destroy—and to occasionally add another sculpted visage or two. But which TV show, comic, video game, movie, or plastic brick-themed recreation center has done it best? Here, we're including additions of faces to the presidential quartet, even if they're meant respectfully and earnestly. Vote for your favorite in the poll, and add any I've missed in the comments. This list was created with the aid of TV Tropes's Rushmore Refacement and Wikipedia's Mount Rushmore in popular culture. Superman's Girl Friend, Lois Lane, #21 (1960): After Lois Lane and Lana Lang gain superpowers, they decide to have a friendly competition to see who would make the best wife for Superman. One of their brilliant ideas: carve their faces near Mount Rushmore so Supes would see them as he flew by. Justice League of America #108 (1973): Alternate Earths abound, but how do you know when you've entered one with a Nazi-controlled America? Just look to see if Hitler's face is carved into Mount Rushmore. Daredevil #109 (1974): DC wasn't the only comics company playing with the idea of the Führer in a beloved American monument. Just a few months later, Daredevil would encounter the Black Spectre, an organization so dark and so powerful that they managed to make a Nazi addition to Mount Rushmore, presumably when no one was looking. Image via The Matt Murdock Chronicles. Superman II (1978): Zod and his Kryptonian cronies know how to throw a conquest. They replace three presidential faces with their own, then leave Lincoln to topple. Judge Dredd, "The Cursed Earth" (1978): Mutants thrive in 2000 AD's Cursed Earth, so it makes sense that they would add a mutant leader to Rushmore—and, for some reason, Jimmy Carter. Wonder Woman #300 (1983): When Wonder Woman imagines herself arriving in Man's World as a ruthless vigilante, she dreams that she'd take what she wants, including a place of honor on Mount Rushmore. Teenage Mutant Ninja Turtles, "The Big Blow Out" (1989): Sadly, Krang never actually carved his brain-like image onto Mount Rushmore. But Raphael imagined it, and so can we. Star Trek V: The Final Frontier (1989): The movie was originally supposed to feature a 2287 version of the monument, which would have included a new addition: President Sarah Susan Eckert. What If...Vol. 2 #4 (1989): Venom runs amok in this imaginary story, and when the symbiote tries to solidify a bond with Thor, Black Bolt's scream is the only thing that can save him. Too bad it also ends up shattering the mountain faces. Give Me Liberty (1990): The first Martha Washington comic reveals that not only is the series' own President Rexall on the monument, so is his predecessor, Mr. Dan Quayle. Mars Attacks! (1996): As part of their reign of terror, the Martians decide to give Rushmore a skull-faced, giant-brained facelift. Incredible Hulk Vol 1 #438 (1996): This rather pointless destruction of Mount Rushmore doesn't just destroy the monument; it also knocks the Hulk out of the air mid-bound. That gives the green guy two reasons to smash. Pilotwings 64 (1996): Mario takes the fifth facial spot in this video game, although players can also switch it over to Wario. Naruto (1997): Hokage Monument isn't actually Mount Rushmore, but an irreverent take on the landmark, featuring the Four Hokages (and later the Fifth). Young Justice #17 (1998): Superboy ends up accidentally defacing the monument during a rescue mission. This destruction (actually of Washington's face, not Lincoln's as on the cover) has serious consequences for the team. Futurama, "When Aliens Attack" (1999): When New New York installed a supervillain governor, he ended up stealing Mount Rushmore. It eventually turned up on Monument Beach, but not before the governor added his own likeness to the rock. The Fairly OddParents: Abra-Catastrophe! (2002): When horrid Mr. Crocker becomes an all-powerful magical ruler, he starts warping reality, including replacing all four Rushmore faces with his own visage. The Mighty Thor: The Reigning (2003): In a future where Thor rules the Earth, a few godly improvements have been made to Mount Rushmore. This is one of the few alterations where rock is actually added to the mountain. Superman: For Tomorrow (2004): In most cases, Mount Rushmore gets a new face, or an old face is replaced or destroyed. In this comic, the entire mountain is animated, transformed into a four-headed monster. Teen Titans, "Revolution" (2004): Brit foe Mad Mod replaces the US presidents with his own favorite Fab Four: The Beatles, of course. Category 7: The End of the World (2005): This storm-centered miniseries takes no mercy with monuments, and Mount Rushmore is no exception. 10.5: Apocalypse (2006): An earthquake tears a nice rift in South Dakota, and the four faces are the first things to go. Danny Phantom, "Reality Trip" (2006): Freakshow is another reality-warper who puts his own faces on Mount Rushmore. Supervillains aren't terribly original, are they? Wolverine: Old Man Logan (2008): After the Red Skull names himself president, he secures his legacy as an egomaniac by making his face the largest one on the mountain. Ben 10, "Ben 10 vs. the Negative 10" (2008): When you keep your superhero headquarters stashed inside a landmark, there's a pretty good chance it's going to be destroyed at some point. The Ben 10 team manages to keep anyone from noticing by putting up a holographic version of the monument. Brütal Legend (2009): Again, not a real Rushmore, but a fantasy rock copy, this time featuring effigies of the protagonist's metal playing faction. Watchmen, "The Keene Act & You" (2009): Naturally, in the Alan Moore-inspired alternate version of the United States, Richard Nixon takes Lincoln's place on the mountain. The Muppets (2011): As a general rule, dynamite-wielding Muppet Crazy Harry should be kept away from monuments. Unless it's funny, of course. Legoland California: This irreverent goof on the real Rushmore sticks a cotton swab in Mr. Washington's ear. Team America: World Police (2004): FranckCarriere noted that I missed this one. Another case of a Rushmore base ending up a target. And there are plenty of non-genre media that deface, destroy, or add a face to Mount Rushmore, including Head of State, MAD Magazine, Deep Purple's album cover for Deep Purple in Rock, Richie Rich, Phineas and Ferb, and many, many more. Add your favorites in the comments!